A few days back one of my book group members wrote a post on rare books asking readers to share their thoughts on rare books and list out their favourite rare books – rare books that they have and rare books they would like to have. As this is one of my favourite topics, I thought I will write about it here. So, here are some of my favourite experiences with rare books. I hope you enjoy reading it. Please do share your experiences with rare books in the comments or post on your blog and tag me. (1) The Grand Babylon Hotel by Arnold Bennett – Arnold Bennett wrote many books and at the beginning of the 20th century, he was one of the important writers in English. But most of his books have gone out of print now except for ‘The Old Wives Tale‘. ‘The Grand Babylon Hotel’ was an odd book in his list, because it was, what we can call today, a thriller. In Bennett’s days there were no thrillers. Most of the story in this book happens in a hotel, there are cool, stylish dialogues, and the main character in the story is the heroine, who is awesome. This book was far ahead of its time. I didn’t read it when I was a kid – my dad read it aloud to me and my sister, and told us the story. I have lots of fond memories of it. When I tried getting it when I went to work, it was out of print. Then I discovered a publisher who printed out-of-print books when a customer orders. I got it from them. It was expensive and it was the pre-Kindle era and the book was poorly formatted. But when I read it, it took me back to my childhood, and that made me very happy – so I am glad I got it. (2) Nobody’s Child by Elizabeth Dejeans – This was probably the first book I ever read. Read is actually an exaggeration. My mom read it and told me the story. It was probably the first thick book I tried reading. I was reading Ladybird books those days which had adventures similar to Enid Blyton’s books. My dad laughed at me and said that I should read more serious books and sent my sister with me when I went to the library next time. My sister thrust ‘Nobody’s Child‘ on me. It was thick and when I tried reading the first page, I couldn’t understand a word. Then my mom took pity on me and read it and told me the story. I don’t remember the story now, but I remember vaguely that it was sad and it was about a girl who was an orphan. Years later, after I grew up, I tried getting this book. I didn’t remember the name of the writer, and there were many books called ‘Nobody’s Child‘. But after a lot of searching, I finally discovered the writer’s identity and also found an e-copy. It was one of the great days of my life. Hoping to read it one of these days. (3) A Study of History by Arnold Toynbee – Toynbee’s book was the historian’s bible before it went out of vogue. In this book, Toynbee tries to study all civilizations since the dawn of time and tries to fit them into a common framework – bssed on how civilizations are born, how they grow, how they achieve their heights, how they die. In a sense, he was trying to write the mother of all history books. The original had 12 volumes, which was later abridged to 2 volumes. My dad was a history teacher for decades and he has been raving about it since I can remember. 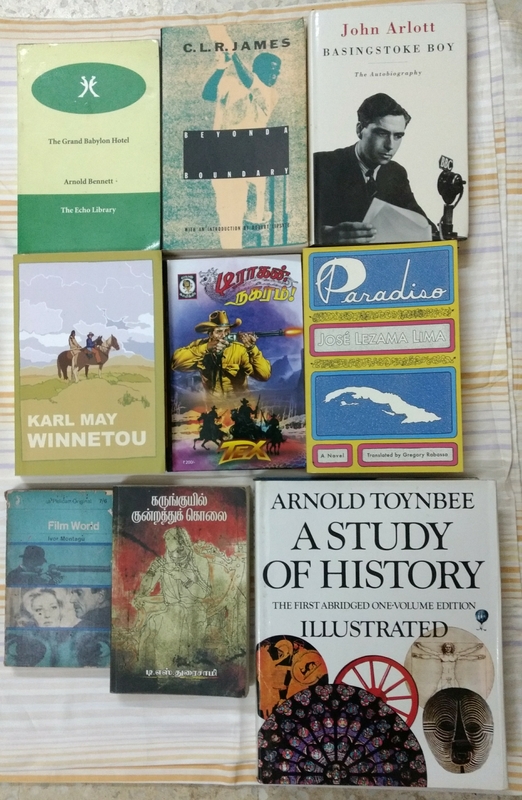 A few years back, when I discovered that my favourite bookstore had published a one volume illustrated edition of Toynbee’s masterpiece, I was thrilled! It is one of the treasures in my collection. (4) The Art of Cricket by Donald Bradman – I read this when I was in school. It was an exquisite 1958 first edition with amazingly thick paper, the likes of which we will never see again. It is one of the finest books on cricket and it talks about everything – how to play cricket, cricket history and everything in between. There is even a wonderful cricket puzzle in the end. When I tried getting a copy of this book after I went to work, it was impossible to find. Then one of the publishers brought it back in print and I was thrilled. (5) Beyond a Boundary by C.L.R.James – James’ classic is regarded as the greatest book on cricket ever written. For many years, it was almost out of print. The only edition available was published by an American university press in the sociology category. It was ironic that the greatest cricket book was out of print in the cricket playing world, but was kept in print in a country which doesn’t play the game and hates the game. I was glad though. I paid a king’s ransom and got it. Reading it was one of the greatest experiences of my reading life. 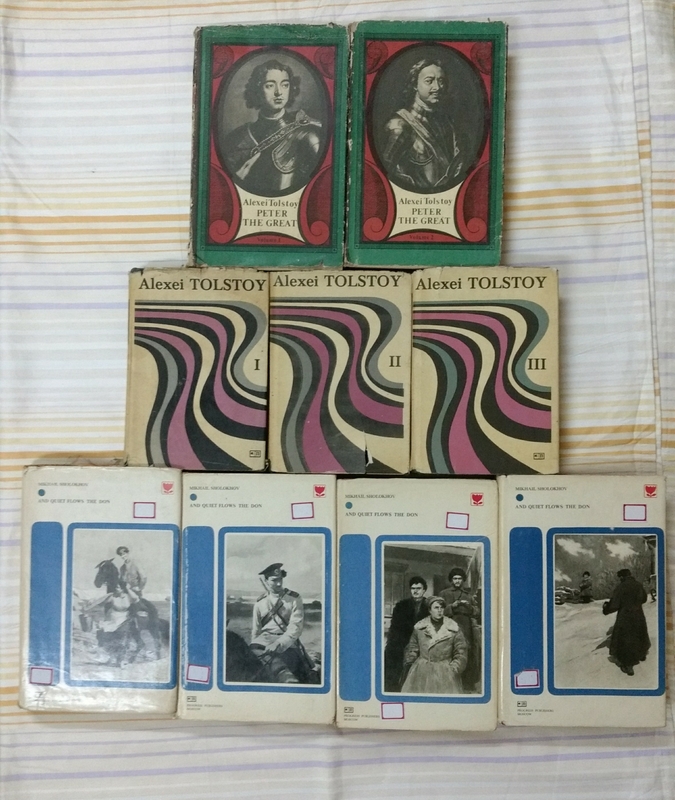 (6) Two books by Alexei Tolstoy – Alexei Tolstoy is a distant relation of the more famous Leo. During his heyday in the 1920s, he was famous for two famous epic novels – ‘Ordeal‘ and ‘Peter the Great‘. ‘Ordeal‘ was regarded as THE novel about the Russian Revolution, for years. Alexei Tolstoy also wrote science fiction for children, much before science fiction for children was written by western writers. He was a pioneer. After the collapse of communism, all his works went out of print. Fortunately, I have both ‘Ordeal‘ and ‘Peter the Great‘. I got it during my schooldays at my school book fair, when Soviet era books were still available. I will never lend them to anyone. (7) And Quiet Flows the Don by Mikhail Sholokov – Sholokov won the Nobel prize for this book. It is in 4 volumes and it is bigger than ‘War and Peace‘. Unfortunately, it is out-of-print. When visiting a secondhand book sale a few years back, I saw a hardback edition of one of the volumes. My heart started beating faster! I was so excited! I asked the organizers of the sale whether they had the other volumes. They took out all four and gave it to me! Wow! It cost me 400 rupees (100 rupees per volume), but for me it was priceless! I don’t know whether the sale organizers knew the value of the thing they were giving away! (8) Dragon City (Tex Willer comic) – I read this when I was in school. It was around 200 pages long and it was the longest comic I had read at that time. One of my friends borrowed it from me and I never got it back. I have pined for it for years. Recently, the publishers brought it back on print. They jazzed it up – the new edition was a hardback and it was in full colour. When the courier guy delivered it and I held it in my hand, I cried. (9) Karunguyil Kunrathu Kolai (Murder in Black Sparrow Hill) by T.S.Duraisamy – There is an old Tamil movie called ‘Maragadham‘ (Emerald) starring Sivaji Ganesan and Padmini. It is a family favourite. It is based on this book. But this book has been out-of-print for decades. 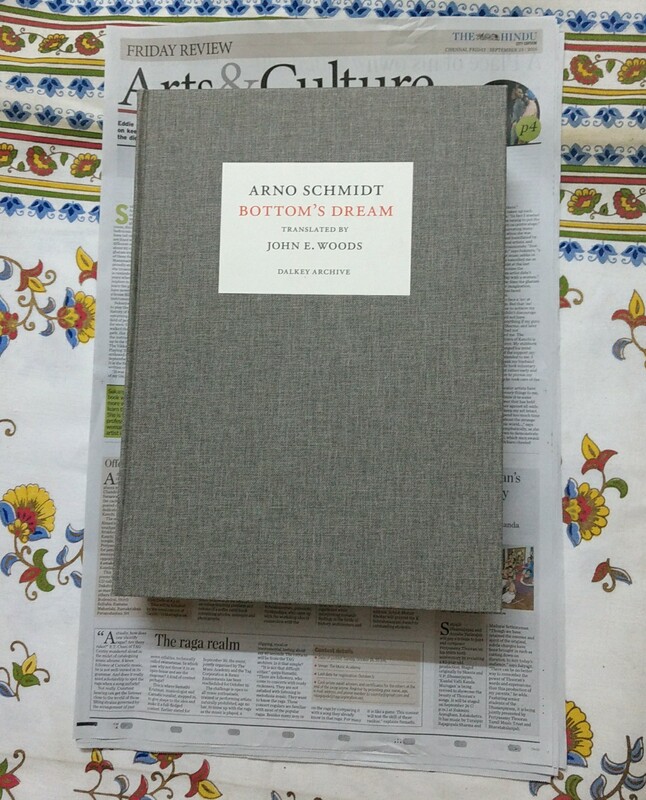 Then someone saw a copy in a library in Pondicherry, found a publisher and brought a new edition out. When I got a copy, my mom was still around. I came home late that night, found mom sleeping and left it next to her pillow. When she got up in the middle of the night to go to the bathroom, she saw the book next to her and she couldn’t resist opening it and start reading it. It was one of the happiest moments of my life. I hope it made her happy too. (10) Paradiso by Jose Lezama Lima – I discovered this Cuban classic through the movie ‘Strawberry and Chocolate‘. The book was banned in Cuba, I think, and the English translation was out-of-print. When it came back in print, I was so excited and got it. (11) Basingstoke Boy by John Arlott – This autobiography of John Arlott has long been out-of-print. When I discovered a secondhand copy on Amazon, I pounced on it. It is a hardback and as good as new. Sometimes we get lucky. (12) Winnetou by Karl May – I have read Spaghetti Westerns (Western stories written by Italian writers), French / Belgian Westerns, even Indian Westerns. When one of my friends told me that Karl May’s ‘Winnetou‘ is her favourite Western, I was surprised that I hadn’t heard of it. Then I did some research and discovered that it is a German Western. English translations of Karl May’s books were either non-existent or hard to come by. Then a beautiful soul called George A. Alexander translated the first volume of the trilogy into English. I was so excited! I don’t think he has translated the second and third volumes. I am still waiting for them. (13) Don Juan, the Life and Death of Don Miguel de Mañara by Josef Toman – While discussing favourite books, one of my friends told me that her alltime favourite book was this one. She said that one day she hoped to find a used copy and read it again. I have never heard of this book or this writer before. So I did some research and discovered that he was a Czech writer of yesteryears and this was his most famous book and it was highly acclaimed during its day. There was one English translation done in 1958 and that was long out-of-print. I thought I will try to track a used copy and if I am able to find one, gift it to my friend for Christmas. Luckily, I was able to. I was so excited when the book arrived and I held it in my hands! And I couldn’t resist reading it, before gift-wrapping it, because I knew that the chances of this rare book passing through my hands again was extremely remote. I have to say that it is a beautiful, powerful book and I am glad I read it. (14) The Satanic Verses by Salman Rushdie – I haven’t read any of Rushdie’s books yet. But this being his only book which is not available in India, and the only book which is probably still banned in India, it has always had the attraction of the proverbial forbidden fruit. So when I went to work abroad and chanced upon this book in a bookshop, I couldn’t resist getting it. I smuggled it in my luggage when I moved back home. I hoped to read it someday. One day one of my father’s friends came to visit and he spied my bookshelf and his gaze immediately fell upon this book and he asked me whether he could borrow it. He was a person whom I knew since I was born and he has always been kind to me and so I said ‘Yes’. And that was that. The book went and disappeared and now it is never coming back. This is what comes of keeping your rare books on display at home. (15) Film World by Ivor Montagu – I had a professor on college who used to give away his old books every year. He didn’t give it away for free, but used to charge a nominal price for each book, like 5 rupees. He wanted students to know that they had to earn the book. He also wanted to make it affordable for them. He was a wonderful human being. When I first went to the book giveaway he had organized, I was amazed at the collection, he had put on display! Most of them were out-of-print. I got a few. This was one of my treasured ones. In it, filmmaker and film critic Ivor Montagu talks about all aspects of film making and the film industry of his time. It is not very big, but it is very beautiful. Used copies of this book are still available in Amazon (US) for affordable prices, even now. (1) The Mediterranean by Fernand Braudel – I saw this first in my college library. It was a Penguin paperback from the ’80s. I have been coveting it since. This and ‘The Identity of France’, also by Braudel. Both of them are out-of-print and hard to come by. However, I was able to get Braudel’s ‘Civilization and Capitalism’ when it came back in print. It is one of my treasured books. (2) The Devil to Pay in the Backlands by João Guimarães Rosa – it is regarded as one of the greatest Latin American books, but the English translation is long out of print. An online scanned copy version was available but the publishers ensured that it was taken down. It was like people didn’t want to publish it and they also didn’t want people to read it. I hope they bring it back. Used copies in Amazon are available from $350 to around $2500. I hope to buy it when it becomes $35. (3) Cricket Country by Edmund Blunden – Blunden’s First World War memoir and his poetry are in print. But his cricket book is not. I want this back! There are two books I have which are about rare books. (1) Lost Classics : Writers on books loved and lost edited by Michael Ondaatje, Michael Redhill, Esta Spalding and Linda Spalding – Writers talk about books which they loved and which are rare or out-of-print now. Beautiful book! I wrote a long review of it when I read it. If you are interested, you can find it here. 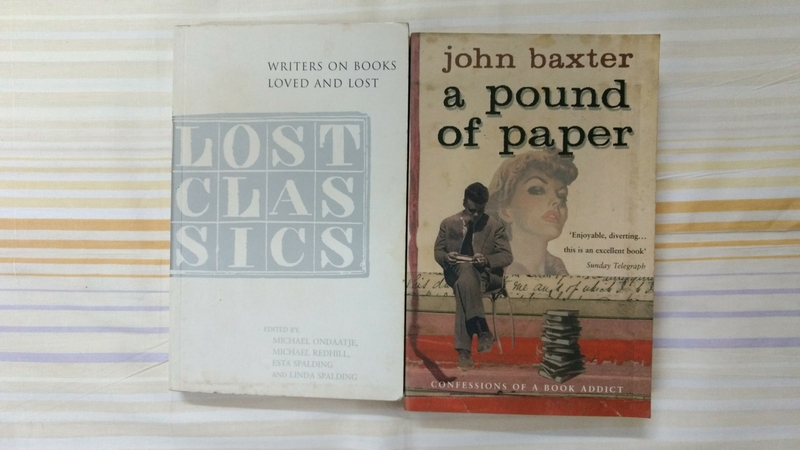 (2) A Pound of Paper by John Baxter – it is Baxter’s memoir on collecting rare books. Please do share your experiences with rare books in the comments or post on your blog and tag me.